The church Maria vom Siege is a historicist building in the 15th district of Vienna, Fünfhaus, not far from the Westbahnhof station. It is a dark brick building with a very large, central cupola that is easily spotted from the Gloriette hill of Schloss Schönbrunn Palace. In fact, this is the only time tourists see it - since it is in one of Vienna′s worst neighbourhoods, people often only drive by it without taking a closer look. The name "Maria vom Siege" ("Mary of the Victory") is derived from a painting that depicts a nativity scene. It was damaged in the 30-Years-War by Protestant troops. Imperial Catholic units had carried the painting into battle and when they were victorious, the Imperial forces donated money towards the construction of a church in Rome. This became "Santa Maria della Vittoria", the model for the church Maria vom Siege in Vienna. The Viennese Maria vom Siege church was designed by Friedrich Schmidt, the architect who has also designed buildings like the Rathaus city hall or the Akademisches Gymnasium. Friedrich Schmidt was a popular architect of the Ringstraßen-Style, recycling styles of various periods in decorative elements on buildings. Maria vom Siege was built between 1868 and 1875 on a site that had previously been mostly agricultural lands. The area of Fünfhas had become a prospering working-class suburb with a rapidly increasing population and needed a bigger church. The church is 68 metres high, which you can′t really tell from the front side - only if seen from further away (such as from the Gloriette) one can fully appreciate its size. 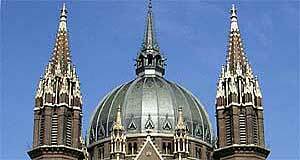 There is a central cupola that dominates the neo-Gothic impression, alongside with two smaller towers. The church has a dark colour scheme, which is not (at least not only) due to the heavy traffic on the Gürtel Road right in front of the church. The interiors are surprisingly light and friendly with several large windows. On contrast to the neo-Gothic outside, the inside of Maria vom Siege resembles a neo-Byzantine style. Until 1984, Maria vom Siege was a normal parish church operated through the archdiocese of Vienna. In 1985, it was given to the order of the Kalasantinians, who are dedicated mostly to missionary work among the working class. They were founded in 1889 by Pater Anton Maria Schwartz, who is buried in the Kalasantinerkirche Church in Vienna in the neighbouring district of Penzing.